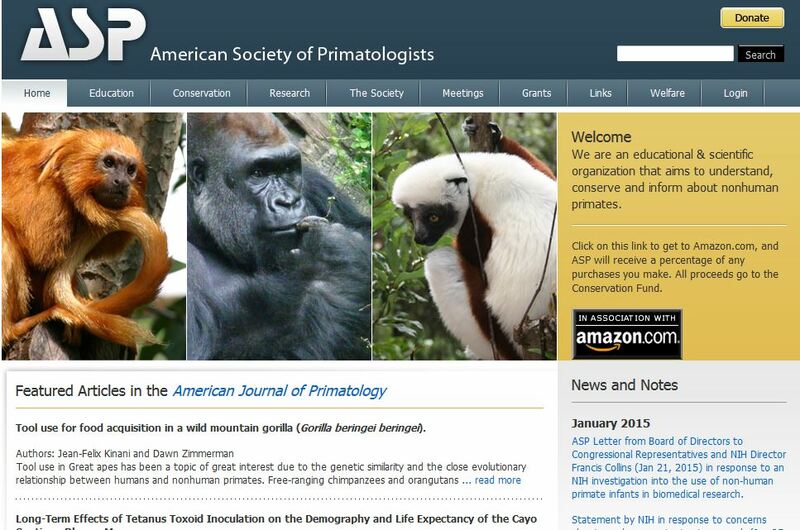 “Members of the Board of Directors of the American Society of Primatologists would like to add our comments to the discussion of the validity and effectiveness of non-human primate research as it pertains to human behavior and medicine. Non-human primate research (on monkeys and apes) has had widespread effect on improving the diagnosis and treatment of many adult and childhood diseases. Studies that have employed the judicious use of non-human primates as models for human illness have improved our understanding of such disorders as autism, childhood leukemia, cerebral palsy, and mental health.1 The long-term research of one scientist, Dr. Stephen Suomi, has been called into question as a result of inaccurate, misguided and inflammatory media accounts. Our comments will address Dr. Suomi’s work and the value of non-human primates in understanding human biology, illness and behavior. Dr. Suomi’s research has focused on the influence of variable environments and genetics on infant development, and by extension variation in adult behavior2. He and his colleagues found that early changes in the degree of attachment between mother and infant have real biological, not only behavioral influences on adult social behavior3. If this finding seems intuitive, it is evidence that the benefits of research have permeated not only the scientific, but also mainstream media4 and literature. Infant subjects are either mother-reared or reared in same-aged groups of monkeys. Infants may undergo temporary isolation during the study5 to facilitate comparison among groups that are reared differently. The goal of much of this research is to mimic separation that every social animal, including humans, undergo during their lifetimes and to understand why individuals respond differently to separation. One such research focus is the development of risk factors leading to mental illness in humans. Because of the close genetic relationship between humans and non-human primates, monkeys are important models for studying particular biological phenomena, including the research conduct by Dr. Suomi. Nevertheless, non-human primates are rare in laboratory populations making up < 1% of the laboratory animals used in research (Government statistics from 2010, cited in Phillips et al., 20146). Furthermore, species are carefully matched to proposed studies. Posted on January 30, 2015 by EditorPosted in NewsTagged American Society of Primatologists, animal research, infant monkey, monkey, NIH, peta, primate, Stephen J. Suomi.